Dissidia Final Fantasy NT, out today for the PlayStation 4, is a game primarily built for competitive online play. It has a story mode, but each chapter has to be earned in battle. When I hear “story mode” in regards to a fighting game, I imagine a short-ish narrative dotted with battles against AI opponents, something to spend an hour or two on while taking a break from battling real people. Dissidia Final Fantasy NT’s story mode isn’t that. It’s a map of connected dots, each representing a short story cutscene or battle. As players move from space to space, the story unfolds of how all of these Final Fantasy characters were yanked against their will into the dimension of World B, forced to battle for a pair of fledgling gods. In order to advance to the next space on the map, players must spend an item called Memoria, which can only be gained as a reward for earning levels. To earn levels, players have to fight other players or AI opponents in the game’s offline gauntlet mode. Players select a space, pay the Memoria toll and whichever content it holds is unlocked, be it a special battle or a cutscene like the one below. Other fighting games use story mode as an escape. Dissidia Final Fantasy NT uses its story mode as incentive to battle and improve. I appreciate that. 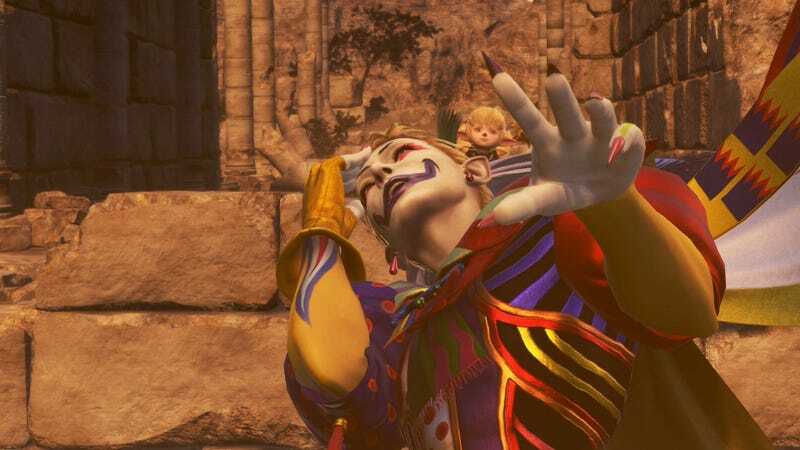 Look for more on Dissidia Final Fantasy NT after we spend more time getting battered by Bartz.